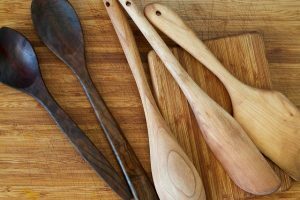 Many people have wooden cooking items in their kitchen—from bamboo cutting boards to serving spoons/forks make from common fruitwood trees. However, these wooden kitchen staples are disappearing from home and commercial kitchens worldwide; ceding kitchen space to plastic and metal replicas. One of the concerns surrounding wooden utensils and cutting boards stems from the fear that the wooden items preferentially harbor bacteria (E. coli.) better than plastic and stainless steel analogs. Additionally, perhaps no aspect of caring for these items causes as much anxiety as how to finish or refinish these utensils with ‘food-safe’ finishes. Finishes that bring out the natural beauty of the wood while remaining safe for human consumption without creating bacterial colonies. Addressing the concern of bacterial contamination in wooden utensils (as compared with stainless steel or plastic), a study in the late 1990’s concluded that using wooden cutting boards “were less than half as likely as average to contract salmonellosis”, while “those using synthetic (plastic or glass) cutting boards were about twice as likely as average to contract salmonellosis”1. Additional studies also concluded these results were independent of the hardwood species (ten total) and the type of plastic polymer used (four total). In short, using hardwood utensils or cutting boards don’t pose a significant risk to human health but plastic cutting boards might. Food safe finishes can be broadly classified into three categories: drying oils, non-drying oils and waxes. Of these three, the drying oils have the greatest resistance to wear and scratches and waxes tend to bring out the shine and rich beauty of wood better than the oils. The drying oils consist of pure tung oil (must be pure tung oil), walnut oil and raw linseed oil (not boiled linseed oil). These oils penetrate the wood and harden on the inside. This provides good water resistance and a modicum of protection from scratches. Avoid using an abrasive sponge during cleanup as this accelerates the breakdown of water resistance. Also avoid using anything less than pure tung oil or boiled linseed oil, as these oils have been treated chemically and are potentially hazardous to humans. Walnut oil comes from the walnut, so using that material might pose problems to people with peanut allergies. Both walnut oil and raw linseed oil are expensive and can also (in time), go rancid. Periodic reapplications of these finishes minimize this conversion to a rancid product. Penetrating (non-drying) oils come as two types: mineral oil and vegetable oils (olive, vegetable, soybean, sunflower, corn, coconut). Of these two types, mineral oil is the better choice for both ease of application and the fact that it won’t go rancid like the vegetable oils (vegetable oils go rancid much more so than even walnut oil). The drawback to using these non-drying oils is that they need to be reapplied regularly. One other note on ‘non-drying’ oils—don’t use baby oil for any wooden utensil; this material has been treated (like boiled linseed oil) chemically and is unfit for use on wooden utensils and cutting boards. The last category of food-safe finishes for wooden utensils consists of substances that form a thin surface film; these include waxes (carnauba, beeswax or paraffin wax) and shellac. Of these, shellac forms the most protective finish for your wooden utensils; its application (mixed as a solution with ethanol) doesn’t penetrate deeply into the surface before it dries to a hard film coating. 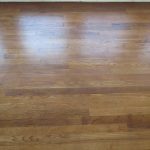 However, the film is resistant to water and scratches and shellac comes in a variety of color choices (super blonde, orange, garnet and many others) to better compliment the variety of hardwoods used in the making of the utensils. The waxes seal and protect the wood at the surface, but obviously need periodic application. However, the beauty and depth of the wood truly shines when a wax is used to protect the wood and often compensates for the additional applications. In addition to using one of the above-mentioned finishes as a standalone treatment for your wooden kitchen gadgets, several combination (and specialty) products are available that combine some the more desirable properties from each finish. For example, combining mineral oil with beeswax or carnauba wax creates a waxy product that allows the oil to penetrate while the wax protects the surface. You can create this yourself by combining 10 oz (300 mL) of mineral oil with approximately 1-2 oz (30-50 mL of wax). Heat the oil and stir in the wax until the solution solidifies. Apply this like you would any wax product. Products like these are also available commercially (Howard is the brand). Specialty waxes for strict vegans are also available (a combination of rice and coconut).